Edited by mnbv_fockewulfe, 24 June 2018 - 11:06 PM. Just wanted to make a quick write up on what the heck these graphs mean. A video should follow in the next week or so. Graph 1, shows the theoretical minimum turn time from stall, to minimum optimum speed (where the white performance band starts), to maximum optimum (where the white band ends), to max dive speed. Where the graph shows velocity approaching stall, is an estimated value and may be higher, and vary between plane. Where the graph shows the plateau and where the lines overlap is when all 5 planes perform the same turn. As velocity approaches max dive speed is an estimate value that doesn't bear much meaning (how often will you complete a 360 degree turn at max dive speed?) aside from showing when a plane performs better at higher speeds. Graph 2, where the lines over lap is where all 5 planes complete a 360 degree turn in the same radius. As you can see, this is a rather large band. Graph 3, shows the maximum G loading for the radius of turn. Refer to the Graph 2 to find out what velocity a certain radius turn occurs. Graph 4, shows acceleration of a P51 A as related to horse power. Blue is cruising HP, while Orange is HP under boost. Also take note that a P51 A experiences .6 Gs of acceleration while under boost. Also note that cruising HP is 48% of max HP. I have some comments on this for my video/later post about whether or not this is still a flying game. Comprehensive comparisons between all planes in the works. I want to find out the secrets of climb rate before I extrapolate to other planes. Edited by mnbv_fockewulfe, 25 June 2018 - 02:10 AM. So we're playing WW2 X-Wing/TIE Fighter now? It begs the question why the game is WWII instead of space themed. The only thing that resembles flight right now is that you gain energy when you dive and lose energy when you climb. edit: in fact, if WG switched the game to some crazy spaceship yamato, WWII airplanes in space I'd be all for the game in it's current state. However it deeply saddens me that WOWP is no longer a WWII flight game. Edited by mnbv_fockewulfe, 25 June 2018 - 01:11 PM. Since 2.0, yes. Previously, it was a pretty simplified model, but at least the basics were there. Now? Not so much. Since the J8M is really a Me163 Komet, it is really a cartoon aircraft in the game. The real aircraft was a rocket with wings, and the rocket was good enough to get the aircraft to 10000 meters where the bombers were. That's it Fire your 30mm cannon at a bomber, then glide back to base. It was sort of a one-shot deal until the tanks were filled again. But in an arcade game, you can kind of do anything you want. The Xwing vs tie fighter factor is one of the main reasons i didnt come back for 2,0. to be fair the flight characteristics of planes pre-2.0 had some interesting ideas behind them. The 410 should not have been a good climber and the zero line should have been. planes that were known for mechanical problems didnt have them and we ended up with the 262 being a dominator just because your engines never failed (and you weren't outnumbers 50 to 1)the attitude bands created a weird imbalance where if you didn't bnz you didn't win (unless you were perfect), seems like something could have been done to keep the flavour of different strengths without the soul crushing imbalance that was there before. Nice to see the numbers indicating that my feelings were not wrong, will keep on checking back to see what new game comes out next patch! This is the main reason behind my work. Quantifying a feeling of something amiss that we vets recognized. I still hold that the game would benefit from moving to a more realistic approach to the flight model. Keep the stylization of air combat that the game had, but make the game actually about flying. p.s. statistics seem to be the only kind of feedback WG accepts. Edited by mnbv_fockewulfe, 26 June 2018 - 03:52 PM. I dunno, it seems like WG deliberately went the other way. I would be great to know the reasoning. This whole deal seems to be an attempt at equalizing pilot skills by removing flight model complexities that could be exploited by superior pilots. A google search for "Arcade flight games" brought up hardly any relevant results. this is one of the thoughts i had about this trend, i learned on the forums here that skill is op. Some serious thinking needs to go into a 3d fight. compare that with ships or tanks and there are complexities (or id be good at both) but not nearly as pronounced. someone can always hide behind a rock and get lucky, or send of a skill wall of torps and get a lucky BB. In the air a plane with more E is going to win most times, and the poor sap who didnt know better is getting stomped. Who has the patience to stick through 150-200 games of whack a mole with you as the mole. on the other side there is less intrinsic reward and player retention suffers. I still get the feeling it was a concerted move to bring in a new crew and hopefully move forward with the rpg style of "pilot over plane". The only one I recall was called "Afterburner". I also remember the LucasArts games "Battle of Britain" and "Secret Weapons of the Luftwaffe." I spent a lot of hours flying WWII planes on a 486.
and if we include weight of fire, because the guns are all reasonably the same, it becomes the hands-down winner? The gentler slope means the P40's turn rate degrades at a slower rate than the other american fighters. 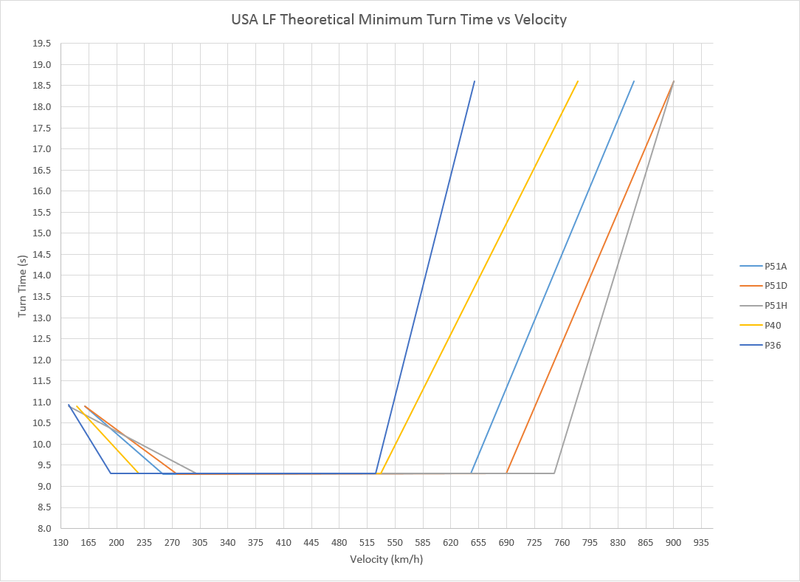 The other US fighters have a steeper slope as speed increases. I am just curious how you come up with these graphs? Is it from experience in the training rooms or elsewhere? Not questioning you, just genuinely curious. Thanks for any response. I am a geek at heart, but not nearly as motivated as you apparently. I did one test in the training room and found a trend. I asked the devs in a Q&A if my results were correct and I was told that I was. So I applied the trends I found to the stats for these planes available in the hanger. So my charts are more approximations instead of something I got out of the game's code. I can do it for any a/c, provided I can have the ingame stats.